Federal agencies failed to follow the law in protecting the habitat of an endangered bumblebee that continues to be found in Illinois despite major population loss nationwide, according to a lawsuit filed Tuesday in Washington, D.C., by an environmentalist group. 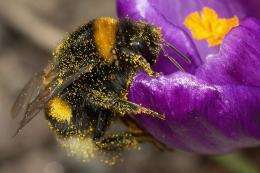 "Habitat loss is a serious threat to the rusty patched bumblebee," the lawsuit said. "The species is predominantly dependent on grassland habitat, which has declined by 99.9 percent since European settlement of North America." "If we are going to save these species from extinction, we need to save their habitats," Riley said Tuesday. Students at Loyola University's ecological campus in McHenry County found the bee feeding on flowers in the summer of 2017, an exciting discovery that inspired greater efforts to document different species on the land. Students did not see the bee again this summer, but that doesn't necessarily mean the pollinator had left, said Roberta Lammers-Campbell, a lecturer emerita at the campus. "I know people spotted it in the areas around us. We just didn't have people spending a lot of time watching for it. We didn't really monitor for it real strongly," Lammers-Campbell said.